As you know, Pro-Duterte groups have mounted a massive rally at Luneta on April 2, 2017. Click here to read about that. Since the organizers are short of funds (hey, that's not new. Remember what we did for Digong during the campaign period? Sisiw. 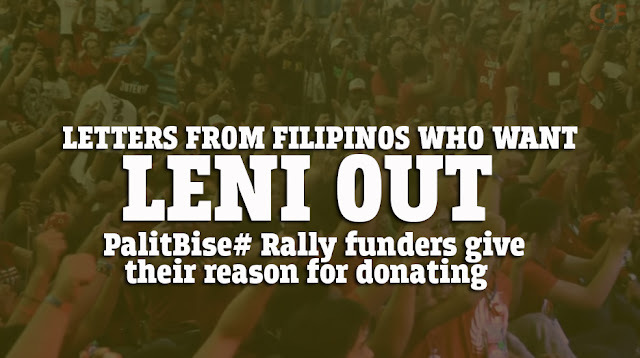 ), they started a GaveGives campaign to gather funds to mount the #PalitBise rally next week. I'm sure you've read snippets of who the funders were and their reasons, but to better understand what's driving these people to give out their hard-earned money for this demonstration of force to support President Duterte, we took time to curate the most compelling reasons that they have given out. Here are the reasons by Filipinos who have donated to mount the rally. The least a simple DDS can do. Thank you for giving us an opportunity to be a part of something big and relevant. For our beloved president Duterte and for our beloved Philippines. Tama na ang panloloko nila sa bayan. Lalaban po kami, Tatay Digong! Lets do this for our president, for our country and for us. Weve been used for years. Weve been abused for years. Enough is enough. Weve had it. Stop the liberals (Yellowzombies) from gaining powers to use it against the Filipinos and the Philippines. keep up the good fight. God bless the Philippines. This donation comes from the bottom of my heart to save my beloved Philippines from those forces of EVIL. Impeach Maria Leonor Robredo and protect our dear President Rodrigo Roa Duterte for he is the best that ever happened in the Philippines, my motherland. Wala talaga akong pera but i know that this is for my country, my biggest contribution na lang is my presence sa april 2, break a leg! Palit bise! Kapit bisig tayo lalo na sa mga kabataan, pro philippines! Pro duterte! To our Motherland. .. please protect my people from harm. God bless PRRD. God bless the Philippines. All honor and glory to God!!! Thanks for setting up this rally for us! Ito po ay ibinawas ko lang sa ipapadala ko sa pamilya ko sa Pilipinas para ipakita ang pagmamahal ko sa aking bayan na pilit sinisira ng mga miyembro ng LP (Linta sa Pilipinas). I a.m supporting Pres. Dutertes administration because I know he wants only the best for our country. Enough of Liberal Party their time is up. They only want money and power and Not Love of country. Pasensyahan nyo na doppleganger ko. In my timeline, I don't own EDSA and I support President Duterte. Dapat nang patalsikin ang nagpapahirap sa Inang Bayan! I believe Duterte can change our lives and he is truly for Filipino people. This is our biggest opportunity to unite behind the president for a brighter future of our country! Para sa mahal kung Pilipinas, puksain ang mga kawatan at mapaglinlang demonyo sa bansa! God bless sa inyong mga makakadalo. Time to end LPs choking hold sa mga Pilipino! The Filipino people are finally awake! I hate drugs and I support the Presidents effort trying to eradicate it from our society. This is for the future of my children. We must protect our beloved tatay Digong with all our might who is genuinely sincere and devoted with his countryl. Long live my President Duterte. Maliit lang ho ang sahod ko. Pero itong inipon kong pera ay buong puso kong idodonate sapagkat si Duterte ay aking pag-asa para sa ngayon, para sa kinabukasan. Wag naman po sanang ipagkait sa maliit na taong tulad ko ang makakamit ng Bagong Pilipinas. Im one with the Filipino people for this fight. Enough of this unrelenting destabilization! I donate because I believe that the President, fairly elected, should complete his mandate of 6 years. Binoto ko si Leni. Nagsisi ako. Para sa bayan! Tayo ang mga bagong bayani ng henerasyon! This is just a small investment for my childrens future. ..to have a drug-free country. I am with you in the fight against destabilizers and power grabbers. Protect the President! Impeach the ****. I would like to thank all the Filipino people who worked hand in hand to make our country,Philippines a better place to live. PROTECT THE PRESIDENT DUTERTE!!! PROTECT OUR BELOVED COUNTRY!! I believe in your advocacy and I want to help. My way of support for President Duterte. God bless our country! protect our President! Impeach Leni fake VP! Bangon Pilipinas! Tulong-tulong sa pagbabago. Oust Leni, traydor sa bayan! Though I'm not there in the Philippines...I'm not be physically present but I want to protect our President Duterte from this rotten LP puppet fake vp Leni Robredo ... I hope that BBM will finally seat as our genuine VP of the Philippines. For my motherland the Philippines... Long live President Duterte and my countrymen! For the motherland. Let us protect our beloved President Duterte. My little way of contribution for the progress of my country. I am a Filipino who for the first time felt nationalism in my bones! The people of Tolosa, Leyte will never forgot how Duterte helped us right after Yolanda. He sent cops from Davao to stop the looting and to prevent criminals from wreaking havoc in the town. Such a great leader, and what an honor to have him as our President. #LeniResign. Supporting the duly elected President of the Philippines Rodrigo Roa Duterte. For the motherland. grateful for our President . ungrateful for our VP who is all talk and no work . For the motherland! Protect the President Duterte!